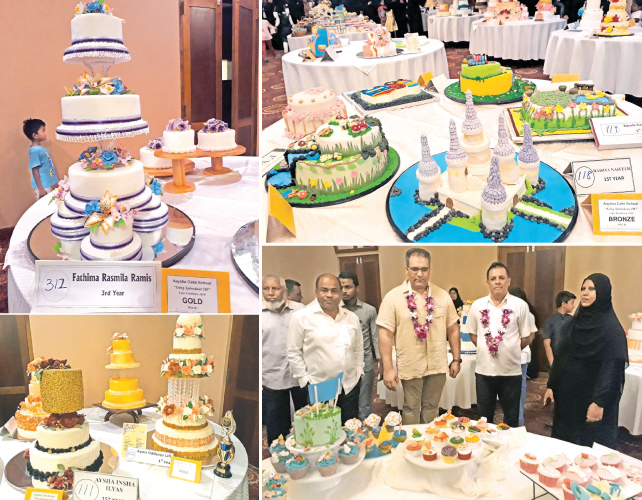 The annual cake exhibition “Icing Splendour III” and handing over the certificates organized by Aysha Cake School China Fort Beruwala was held at the Cinnaman Bey Beruwala recently. Cinnoman Bey Beruwala General Manger, Mike M. Jawad was the Chief Guest of the event which was held under the patronage of Directress, Maheesa Zawahir Azhar. Cinnoman Bay Assistant Manager, Sujith De Silva and Urban Council Beruwala Chairman Mzahim Mohammed was the Guests of Honour. Aaysha Cake School which was started in 2000 is held at 23, Yousuf Avenue, China Fort, Beruwala and at 125, Daham Mawatha, Ratmalana. During the past years more the 1,000 students have received diplomas in cake decorating.